THIS PAGE IS FOR A DESIGNATED DRIVERS ONLY DRIVING YOUR VEHICLE. 6 Hour Wine Tasting Tour Chauffeur. 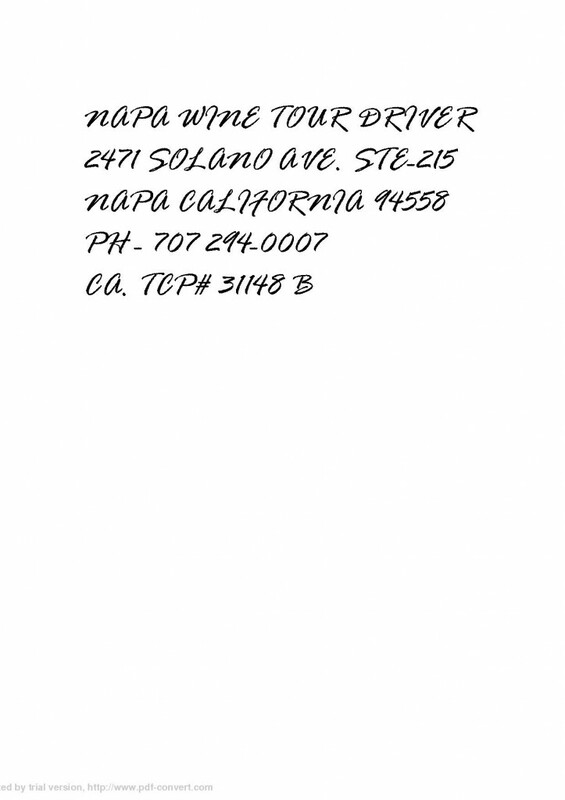 Our rates are $40 an hour credit card or $35 an hour cash for Napa County & Town of Sonoma only. 4 Hour Wine Tasting Tours is $50.00 Cash or credit for Napa County & Town of Sonoma Only. Petaluma, Rohnert Park, Glen Ellen, Kenwood, Santa Rosa to Healdsburg it is $50.00 credit card, $45.00 an hour cash or credit card for 6 hour tour. If farther than Healdsburg please call for price quote. Using your 10 person rental van using our driver is $70 an hour. Six hour minimum. For other options please call 707-294-9722. Please note: More information about RENTAL VANS. If you use another company they must have a TCP License, 1.5 million in commercial insurance and a Class “B” drivers license to drive 11 or more people. If you driver does not have these items he/she can be arrested if stopped by law enforcement and will be taken to jail. Monday Through Sunday Cash Specials: If you book a continuous 10 hour cash only wine tour and dinner transportation driving your car only. No Vans. Napa or Town of Sonoma only $350.00. You save $100.00 off the regular rate. Petaluma, Rohnert Park, Santa Rosa $400.00. Healdsburg, Guerneville and Marin County is $400.00. If farther than Healdsburg please call 707.294.9722. If you take cabs for dinner they will be costly just for one way. If you plan your tour to include dinner transportation you will not need a cab. This is by far our most popular Napa or Town of Sonoma Wine Tasting Tour. Marin County, Guerneville, Healdsburg, Santa Rosa Monday-Sunday 6 hour minimum, plus travel time. We require a reservation by credit card, for our services. Go to the Contact Page and fill in all information to book the tour. Pick up times can be changed any time up to the 24 hour before your tour time. After that all times are set. The reason is in case the driver does not get the change in time. We give them all the information on the wine tour after the 72 hour cancellation policy time is up. Type of tour and date of tour are set in stone inside 24 hours. You agree to the terms of this website when give us your credit card information. All credit cards for booking purposes are subject to a 72 hour cancellation procedure. If you cancel outside the 72 hours before your wine tour date you get a refund if one was charged. If you are inside the 72 hours the deposit (if any) is not refundable and you are responsible for the balance of the 6 hour tour and multiple days if it applies and your credit card will be used to pay the balance. You must call the office to cancel only @ 707 294-9722. Then you will get a confirmation email that your tour is cancelled outside the 72 hour procedure. All deposits returned are subject to credit card return fees. By submitting your cc card info you agree to the terms above and for the cars you want us too drive. Our address is 2471 Solano Ave, Ste. 215, Napa CA 94558. You also agree for all costs associated and not just limited too bank fees in collecting the dishonored checks or 3% charge for Credit Card payments or cancelled tours. Thank you for using My Private Driver Referral Service.